This is a holding device is basically cylindrical in general. We manufacture highly designated Metallic Collet to fulfill the needs of automobile and construction industries. A collet is specifically known as holding tool but beside that it can be used as tightened device. These products are used in precision turned component industry. 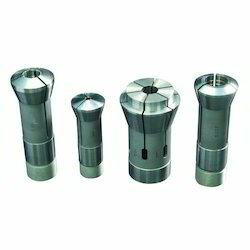 Metallic Collet These products are used in precision turned component industry. We are a manufacturer of Industrial Collets for various sliding head machines. We have all the details of machines like Petermann, star, Bechler, Tornos, Citizen etc. 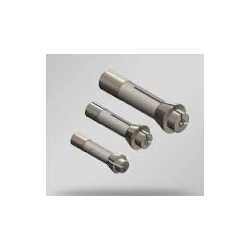 We have many satisfied customer's in precision turned component manufacturers. These are used extensively in Watch manufacturing industry, other precision turned components like automobile industry, etc. Material: Steel as well as carbide lined. 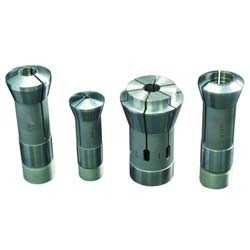 We offer high quality R8 Collet are typically used as holders for tool shanks. Our product can be used in R8 fixtures and R8 precision spindles. Beside that R8 collets are also used in the production companies, milling machines, machining centers, r8 precision spindles and R8 collet fixtures. R8 collets permit more rapid tool changes, and provide an inexpensive and accurate tool holding method. R8 collet is readily available in affordable price. We offer these R8 collets in carbide lining as well. R8 Collet is readily available in affordable price. We offer these R8 collets in carbide lining as well. Looking for R 8 Collets ?